Gull is the common name for any of the aquatic birds comprising the family Laridae, characterized by long and narrow wings, strong bills that are hooked at the end, webbed feet, and normally white or gray plumage with gray or black markings on the head or wings. They are chiefly coastal birds, found near all oceans, but also are found commonly in various inland waters. In common usage, members of various gull species are often referred to as sea gulls or seagulls. This name is used by layman to refer to a common local species or all gulls in general, and has no fixed taxonomic meaning. For humans living along temperate coastal areas, gulls are a ubiquitous part of the landscape, adding to the wonder of nature. Ecologically, they are important components of food chains, consuming various crustaceans, fish, mollusks, and insects, while their young and eggs are consumed by various vertebrate predators on land and in the ocean. Some taxonomies consider terns as a subfamily of Laridae, although there is a tendency now to consider them their own family, Sternidae. Gulls are typically medium to large birds. They range in size from the little gull, at 120 grams (4.2 ounces) and 29 centimeters (11.5 inches) in length, to the great black-backed gull, at 1.75 kilograms (3.8 pounds) and 76 centimeters (30 inches). Gulls tend to be heavily built. They have long and narrow wings for flying and webbed feet for swimming; the wingspan ranges from two to five feet. Gulls have stout, long bills with a slight hook on the end. There are about 50 species of gulls, with most in the genus Larus. Apart from the kittiwakes, gulls are typically coastal or inland species, rarely venturing far out to sea. The kittiwakes, which comprise two species in the genus Rissa, are oceanic gulls that are rarely found on land. Gulls are very common in coastal areas in temperate and arctic areas in the Northern Hemisphere. Most gulls, particularly Larus species, are ground nesting carnivores, which will take live food or scavenge opportunistically. The live food often includes crabs and small fish, as well as mollusks and insects, and even small rodents. The young and eggs are subject to predation from mammals, snakes, and predatory birds, while even the adults may be at risk from sharks and larger predatory birds. The large species take up to four years to attain full adult plumage, but two years is typical for small gulls. Nesting areas may be some distance from where gulls are actually seen flying or scavenging for food, and parental gulls can be highly protective of their eggs and young. Gulls—the larger species in particular—are resourceful and highly-intelligent birds, demonstrating complex methods of communication and a highly-developed social structure; for example, many gull colonies display mobbing behavior, attacking and harassing would-be predators and other intruders (Alcock 1998). In addition, certain species (e.g. 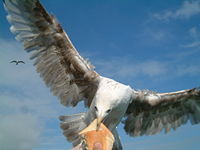 the herring gull) have exhibited tool use behavior. Many species of gull have learned to co-exist successfully with man and have thrived in human habitats. Others rely on kleptoparasitism (taking prey from another animals that has caught it) to get their food. Fifty-five extant species in six genera are recognized in the list of species below, with 49 of the species in the genus Larus and two species in Rissa. Only one species is placed in each of the remaining four genera, Pagophila, Rhodostethia, Xema, and Creagus. 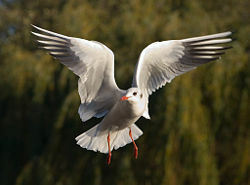 Gulls are most closely related to the terns (family Sternidae), which previously had been considered a subfamily of Laridae (van Tuinen et al. 2004). The American Ornithologists' Union continues to combine Sternidae, Stercorariidae (skuas or jaegers), and Rhynchopidae (skimmers) as subfamilies in the family Laridae. However, recent research (Paton et al. 2003; Thomas et al. 2004; Paton and Baker 2006) indicates that this is incorrect. Gulls are only distantly related to auks and skimmers, and more distantly to the waders. Most gulls belong to the large genus Larus. Large white-headed gulls for the 16 Herring Gull-like species from great black-backed gull to lesser black-backed gull in the taxonomic list below. White-winged gulls for the two Arctic-breeding species Iceland gull and glaucous gull. Hybridization between species of gull occurs quite frequently, although to varying degrees depending on the species involved. The taxonomy of the large white-headed gulls is particularly complicated. The Laridae are known from fossil evidence since the Early Oligocene, some 30-33 mya. A fossil gull from the Late Miocene of Cherry County, USA is placed in the prehistoric genus Gaviota; apart from this and the undescribed Early Oligocene fossil, all prehistoric species are at least tentatively assigned to the modern genus Larus, q.v. The Swallow-tailed Gull, endemic inhabitant of the Galápagos Islands. Swallow-tailed Gull in flight, showing wing patterns. Heermann's Gulls have all over greyish plumage with a white head during the breeding season. Alcock, J. 1998. Animal Behavior: An Evolutionary Approach, sixth edition. Sunderland, MA: Sinauer Associates. ISBN 0878930094. Olsen, K. M., and H. Larsson. 1995. Terns of Europe and North America. London: Christopher Helm. ISBN 0713640561. Paton, T. A., and A. J. Baker. 2006. Sequences from 14 mitochondrial genes provide a well-supported phylogeny of the Charadriiform birds congruent with the nuclear RAG-1 tree. Molecular Phylogenetics and Evolution 39(3): 657–667. Retrieved November 5, 2007. Paton, T. A., A. J. Baker, J. G. Groth, and G. F. Barrowclough. 2003. RAG-1 sequences resolve phylogenetic relationships within charadriiform birds. Molecular Phylogenetics and Evolution 29: 268-278. Retrieved November 5, 2007. Thomas, G. H., M. A. Wills, and T. Székely. 2004. A supertree approach to shorebird phylogeny. BMC Evol. Biol. 4: 28. Retrieved November 5, 2007.
van Tuinen, M., D. Waterhouse, and G. J. Dyke. 2004. Avian molecular systematics on the rebound: a fresh look at modern shorebird phylogenetic relationships. Journal of Avian Biology 35(3): 191-194. The Norwegian Gull Page: Huge picture archive including all NW European species, as well as features from the Nearctic and SE Europe. Bird pictures - Gulls: Pictures and descriptions of large gulls from The Netherlands, France, Spain and Poland. This page was last modified on 20 July 2017, at 00:04.